There are lakhs of Micro, Small and Medium business in India and their success is critical to the Indian growth story. Indian Government understands this and are taking steps to create a support ecosystem where these businesses can thrive. In an event in Delhi, MSME Minister Kalraj Mishra has launched an Android app that provides solutions to budding entrepreneurs and existing MSME entrepreneurs of different dimensions like marketing, finance, training and capacity building, different government schemes and opportunities. ? 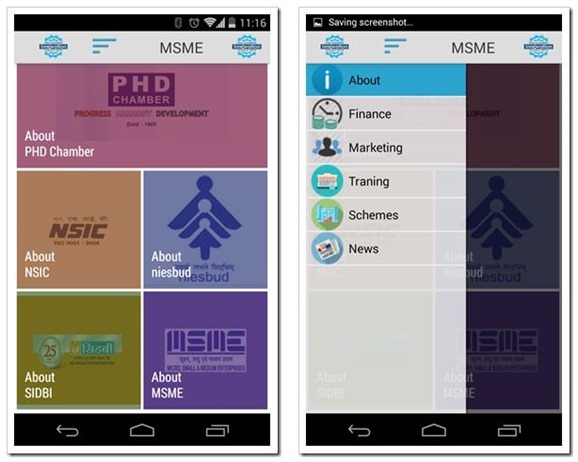 The Android app called PHD-MSME App is targeted towards MSME sector and has been created by PHD chamber of Commerce with help of students from Delhi University. One of the key aspects that Union Ministry is currently lobbying for is to create better provision of finances at base rates by Banks and financial institutions to MSME sector. For a small businesses to grow and succeed, access to finances at low interest rates play a critical role. Mishra said, “My Ministry has been working hard to make sure that the new government succeeds in setting up of Credit Guarantee Trust Funds to extend liberal packages to MSME as a whole and inputs have already been incorporated in the new draft MSME Policy which is at the advanced stage of finalization. The government proposes to roll out the new policy in the next 30 days”, said Mr. Mishra. In the new policy, it is expected that general procedures as well as procurement procedures would be vastly simplified and all clearances for setting up of micro and small businesses would be accorded online within a fixed period of 15 days. The app essentially is the bridge for entrepreneurs to access all the information about various schemes, finance options, training programs etc that available for consumption of entrepreneurs. The App provides solutions to budding entrepreneurs and existing MSME entrepreneurs of different dimensions like marketing, finance, training and capacity building, different government schemes and opportunities. ? As the app is still new, a lot of information is still in “coming soon” mode. However, MSME entrepreneurs are sure to find this app very useful. You can download PHD-MSME App from Google Play Store.